Two things will decide outcome of your interview for a technical writer job: Your answers to their questions, and the quality of your portfolio. Let’s have a look at the latter first. In this context, portfolio stands for a collection of your best works. Your best designs, manuals, how-to guides, and journal articles–or anything else you have done before, if this is your first job application in a field of technical writing. A great portfolio can sometimes win you a job contract–without a single interview answer. But you have to know how to put it together, and how to talk about your best works. Let’s have a look at it now. 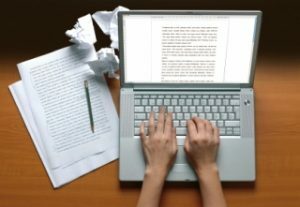 Why do you want to work as a technical writer? Why do you want to work for this company, and not for one of our competitors? Give me an example of a time when you had to explain something fairly complex to a frustrated client. How did you handle this situation? The key is to show the interviewers the value you brought with your work to every single project, explaining how it helped your employer (or clients if you were self-employed before) to reach their goals. Doing this, you not only show that you can draw, design, and write excellent materials. You also show the right attitude to work: always thinking on the final user, and the goals of your employer. For more information on how to make a great portfolio, check this article: Portfolio in an interview. Now we will look at the questions you will face. 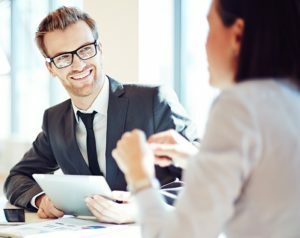 The hiring managers will typically ask you some personal, behavioral, and some technical questions. Mixing it this way, they are able to create a good picture of both your personality and skills, and of both your attitude to work and readiness for the job. Talk about your passion for design. Say them that you enjoy doing what technical writers typically do. The key is to convince them that you won’t get bored in the job, and that you do not apply for it just becasue it pays well, or becasue you earned a degree in a related field, and need any kind of a job. Another option is to refer to your abilities, skills and strengths that make from you a great candidate for the position. A pre-interview research will help you greatly. You should read the job description carefully, and study the website of the company. Try to find as much information as possible about their products and values, their history and working environment. Once you know something about them, you should be ready to come up with a good answer. For example, you can say that you really like their products (naming particular products you like), and can imagine making great user guides to them. Or you can claim that their values and goals resonate with your strongly, or that you like the working environment and employee benefits. And if you can find nothing special about the company, you can simply say that the location is great, or that you like the working hours. But this should be your last option. Average employees go to work only to do their job, and earn money. Exceptional employees actually try to achieve something with their work. To which group do you want to belong? Now, you do not have to speak about some big goals, such as winning design of a year award, or making a most beautiful and intuitive user guide that has ever existed. You can refer to the very simple things, things that are priceless for every employer. For example, you can say that you want to prepare manuals that everyone will understand, or that you want to help your employer to improve their reputation, with easy to understand user guides. You can also say that you hope to learn in your new job, and become even better in what you do. The key is to show them that you see your job as a game, a game you will enjoy playing, and will do your best to bring some value to the team. If you manage to do this in an interview, your chances to succeed will improve immediately. This is a behavioral question, and you should speak about a situation from the past. Try to pick a situation that had a happy ending, when a client finally understood what you wanted to convey. You can say how you used illustrated charts, diagrams, demonstration, or other tools to eventually get the message over. Speak about the situation in a calm and cheerful voice. Show the interviewers that explaining something technical to someone else does not frustrate you. Many employees in the company will depend on your work. Your guides, manuals, and other materials will be essential for their work, and often they will be unable to move forward without them. You will often face a tight deadline, and your attitude to such a situation in crucial for the hiring managers. Try to speak about the situation when you eventually met the deadline. Show them that you can prioritize your tasks, that you do not crack under pressure, and understand the importance of delivering your work in time. And if this is your first job application, say what you would do to meet the deadlines. Your attitude is the most important thing for the interviewers, not the situation you’ll talk about. Technical writer is not a man locked in his office. You will work with other people, and you should give them credit for their work. You should be able to clearly define the roles other people had in the project, and how you cooperated together to finalize the user guide, manual, or any other work. Once again, your attitude matters the most for the interviewers. Show them that you can appreciate the work of other people, that you are open to hear a constructive criticism, and that it is easy to talk to you and to work with you. What motivates you most in this job? Describe your most successful and least successful project. Which tools and programs do you use in your work? Give me an example of when you thought outside of the box. How did it help your employer? Describe a time when you received a negative criticism on your work. How did you react to it? Describe a time when you struggled with motivation in job. 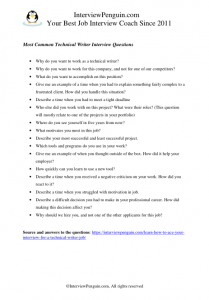 Note: If you struggle with answers to these questions, consider having a look at our Interview Success Package. Multiple brilliant answers to all difficult personal and behavioral questions will help you greatly in your technical writer interview. Two things will decide the outcome of your interview for a technical writer job: Your answers to the questions, and your portfolio. Success and failure is not a question of luck. Prepare a great portfolio, and learn how to talk about your projects in a right way: showing the value you brought with your work. Practice with the questions from our article, and try to come up with a good answer to each question. If you are not sure how to do it, seek an assistance of an interview coach, or check our Interview Success Package. Portfolio in an interview – Learn how to create a great portfolio that can win you a job contract. 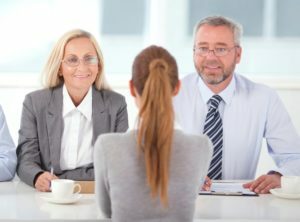 Section for employers – Do you struggle with conducting interviews? Learn how to identify the ideal candidate profile, how to compose a great interview template, and choose the right person for the job.